Ekström took an emphatic victory at Hockenheim. © ITR. 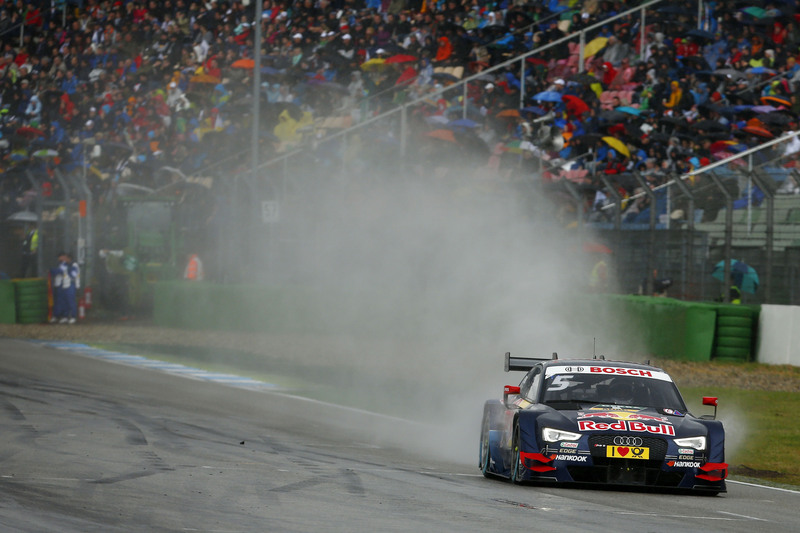 Mattias Ekström made the most of worsening conditions at the Hockenheimring today to take the 18th DTM victory of his career. Ekström’s Audi teammate Edoardo Mortara made it an Abt Sportsline 1-2, while ART GP Mercedes completed the podium after climbing from the final row of the grid. It was a perfect start for Ekström. In a race that started out as a dry run, Ekström pulled ahead of poleman Mike Rockenfeller (Phoenix Audi) off the line, with RMG BMW man Marco Wittmann and Mortara assuming 3rd ahead of the sluggish Rockenfeller. Initially Ekström pulled a slender lead over Wittmann, until the BMW racer dropped to 3rd behind Mortara on lap nine; however as the move played out, the sky darkened and by the one-third mark, rain began to drop over the Hockenheimring. First the rain came as a greasy drizzle that made the drivers appear in elegant, but when the downpour became more apparent, the field began to pit to change to the wet Hankook compound. Of the frontrunners, Mortara was the first to bite, as he pitted on lap 12, followed by Ekström, Rockenfeller and Martin Tomczyk a lap later. The extra lap on wets gave Mortara a brief lead as the Italian Mortara made good use of his tyres in the dampening conditions; however there was little he could do when the charging Ekström came upon his rear on lap 16. Getting a good run out of turn two, Ekström slipped down the inside of Mortara through the Parabolika and ran Mortara wide through the hairpin, giving his Audi stablemate no opportunity to gain a switchback on the exit. Mortara had no chance thereafter, as Ekström – clearly in his element – pulled easily away from the field and built an 8.4s lead by lap 25. Over the final ten tours, the leader managed the gap to Ekström – and more importantly Paffett – to claim victory by 7.36s after 35 tours. Paffett enjoyed a relatively good qualifying session with Paffett losing his 8th place on the grid, when a mechanical issue saw the former champion excluded from the results. Starting 22nd (with Adrien Tambay also excluded and Lucas Auer unable to start due to a mechanical failure), Paffett had already climbed to 18th when the changing weather enforced a stop in lap 12. Such was Paffett’s stellar pace during the crossover from dries onto wets that the Englishman emerged in 8th place once the last of the stoppers – Miguel Molina (Abt Sportsline Audi), Antonio Felix da Costa (Schnitzer BMW) and Timo Scheider (Phoenix Audi) – had made the move to wet Hankook’s. Thereafter, Paffett charged up the order, taking Robert Wickens (lap 18), Bruno Spengler (lap 21), Rockenfeller (lap 23), Wittmann (lap 24) and finally Martin Tomczyk (lap 28) to assume the podium. It was not with some luck however – Paffett required two go’s to get past Spengler and even clattered the rear of the MTEK BMW man as he followed through the hairpin on lap 18. Although lightly damaged, Paffett continued, although he noted that the impressive pace of Tomczyk made for a tricky overtake. Paffett was closing in on Mortara when the chequered flag came out, but the Mercedes veteran fell just 0.8s short of catching the Audi. Mortara admitted that he was beginning to struggle in his Audi and may have even lost the runner-up position had the race been slightly longer. Behind Paffett, Tomczyk enjoyed a healthy gap over Wittmann, who was battling hard with Rockenfeller and Robert Wickens to the flag. Come the race end, Wittmann appeared to be struggling the most of the trio, but lucked into the fact that Rockenfeller was unable to go completely aggressive while Wickens was on his tail. The trio would eventually cross the line covered by 1.7s. After a promising performance in Race One, Pascal Wehrlein had a quiet Sunday and finished 8th, while Spengler dropped backwards late on, with the former champion falling from 6th in the latter third of the race as he began to struggle more with an ill handling BMW. Timo Glock rounded out the points with another reasonable drive to 10th place. The former F1 racer was just shy of Spengler, but also only possessed a narrow gap over the charging Vietoris, who appeared to come alive late in the race. Yesterday’s winner Jamie Green could only manage 13th in the “strategy race”, while Paul di Resta – 3rd on Saturday – ended the race a lap early in last position. It was an awful day for Molina. After qualifying on the front row, the Spaniard took a penalty to start 4th, before an awful start relegated him to 8th by turn one. Molina’s late stop for wets dropped him further down the order. The Audi man would eventually end the day 18th and 71s adrift of the winner. 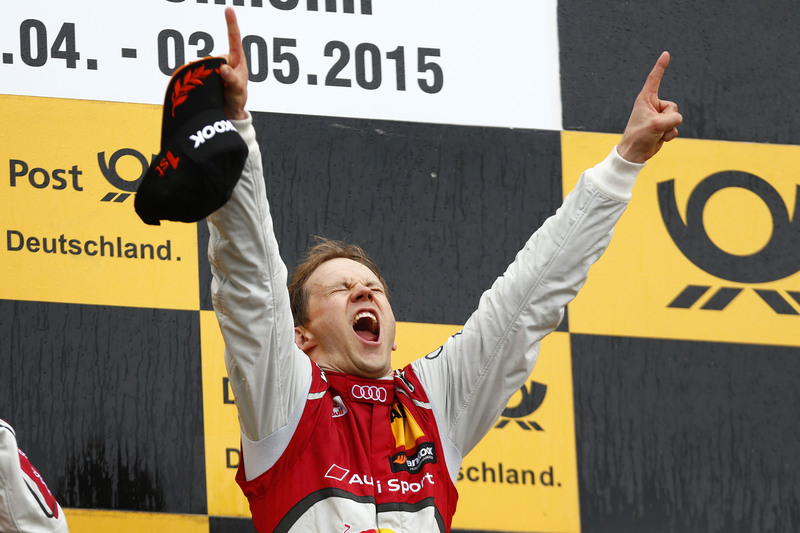 Ekström conquered the wet conditions. © ITR.